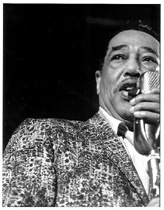 The always elegant Duke Ellington at the Randall's Island Jazz Festival in New York, 1959. Duke was always special; the best American composer ever and his orchestra lasted for fifty years under his direction. When he died, some of jazz died with him. As Miles once said, "On any given day every jazz musician should get down on their knees and thank Duke."